It’s Saturday, and 95 degrees out. Rather than going to the pool, or park, or something away from home, we are getting things done. We’re doing yard work! A few months ago, before the ‘monsoon season’ we had here in the midwest, we ripped out all of our front yard ”landscaping”. The people we purchased the house from hadn’t done anything with it for over 15 years from what we could tell. The bushes had grown over the windows, there were random sink holes, and mulch, covered with rocks, covered with more mulch. It was a disaster. Feeling motivated to have our yard look as nice as our neighbors’ yards do, we made a plan. Then it rained for roughly 2 months and nothing got done. We now have empty dirt beds and weeds. So today we’re on a mission to make it look somewhat better. We’re new to this, and basically live on the DIY channel. Ahmed, we need to find you! Come to our HomeDepot! (Just send us a sneaky message letting us know you’ll be there, we’ll keep it a secret, promise!) We LOVE Yard Crashers, and Desperate Landscapes. Our’s is pretty desperate. While we head back to work in the heat, we want to know: What yard projects are you doing? Do you have any suggestions for plants for a front yard? 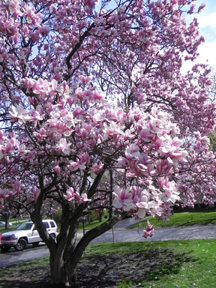 We have a beautiful Magnolia tree to work around!